Azerbaijani cuisine comes up with diverse recipes of soups. National cuisine includes more than 30 kinds of it: hot meat soup (piti), cold one with yogurt (dovga), with flour (umach), with ballotines (kyuftabozbash) and many others. As lavangi (chicken stuffed with nuts) has always been associated with Lankaran, qutabs and dushbara with Absheron and gurza with Baku, piti is Sheki’s signature dish. Piti soup is the unchallenged favorite at the table. The etymology of the name is derived from the Turkic word bitdi, which means the end of need to eat more food. This delicious full flavored soup is the distinguished dish of Sheki -- beautiful mountain city located 370 km away from Baku. It is traditionally a worker's dish, local people say. They believe that one portion of piti is enough for a worker to live through the whole day. Piti contains a lot of calories and very filling ingredients. The secret to real piti flavor lies in the pots in which it’s cooked. 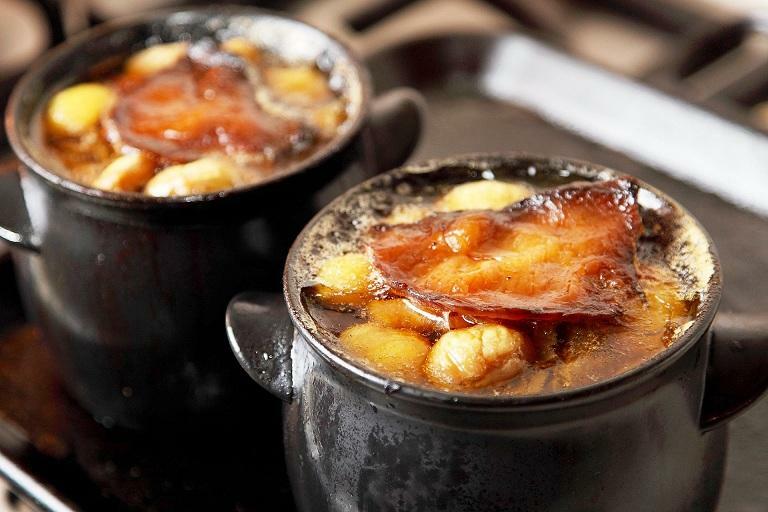 The dish is cooked in ceramic clay pots called “dopu”. Dopu come in different shapes, but the most widespread is the small pot which holds a single serving. It takes the hands of a master craftsman to shape a dopu. Peas and lamb have been considered the main ingredients of piti since ancient times. This delicious soup is traditionally made of chickpeas soaked in water overnight, lamb, onion, saffron, chestnut, dried plum and sheep tail fat. The secret to a good piti is long, slow cooking. Take two or three 55-60 gram pieces of mutton for each portion of piti. Soak peas in cold water for 4-5 hours. Put meat and peas in a piti pot and little by little cook on low heat. Cut onion and quince. Preheat the oven to 190 degrees. Put onions, meat, quince and peas in pots. Fill the pots on half. Then, add 1 cup of boiling water to each pot, cover with lids and put in the oven for 30 minutes. After 30 minutes take out the pots from the oven. Add potato and tomato and boil until cooked. Cook another 40 minutes. Salt and pepper to taste. Piti is usually served in a pot it was cooked in. Pieces of dried lavash are put into the broth, which is traditionally eaten separately from the meat and vegetables. Later the stewed meat and vegetables may be mashed together and eaten. You can still visit cafes in Azerbaijan called "pitikhana" (piti houses), where piti is served in the traditional pot dopu . Here you can find the instruction on how to eat piti in a right way. Sheki people see at the root when say that piti is two dishes in one. First comes the soup. Break up some dry bread in a bowl and pour the liquid out of your dopu over the bread. When you have enjoyed the soup with sumac and onion, spoon the remaining contents of the dopu into the bowl. Mash together the tender meat, chickpeas, chestnuts and plums and eat with more sumac and onion. Tea would be the best way to conclude your meal.